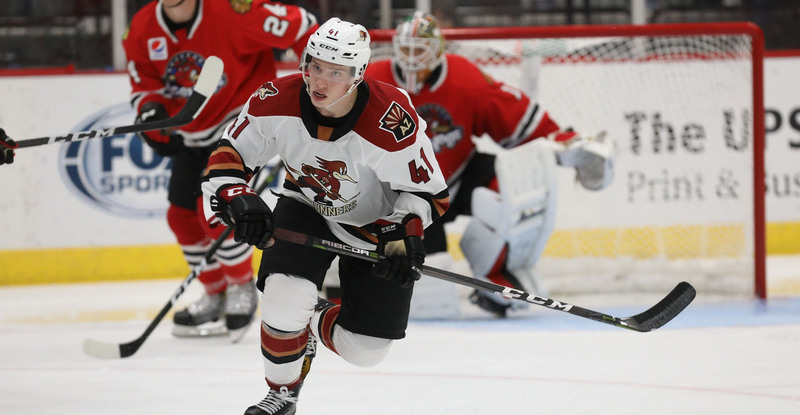 The Roadrunners suffered their first regulation loss Saturday night to the Rockford IceHogs at Tucson Arena, topped by a 5-3 count. Tucson was the 29th team in the American Hockey League to fill its loss column, only the Springfield Thunderbirds and San Jose Barracuda remain unbeaten. Now with a .750 win percentage, the Roadrunners have matched their six-game starts from the two years previous, when they began with 4-1-1-0 marks. They currently stand at 4-1-0-1. After the Roadrunners built a 3-1 lead early in the second period, the IceHogs responded with four unanswered goals to earn a weekend split. Jens Looke netted his third goal of the season just over five minutes into the contest, giving the Roadrunners a 1-0 lead as he upped his season point-total to five (3G, 2A) in just three games played. Rockford evened the score 1-1 at the midway point of the first. With just under five minutes to play in the opening frame, Lane Pederson buried his first goal of the season after receiving a pass from Tyler Steenbergen, giving the Roadrunners a 2-1 lead. Early in the second, Trevor Murphy beat Rockford’s Collin Delia with a slap shot to up the Roadrunners’ lead to 3-1. 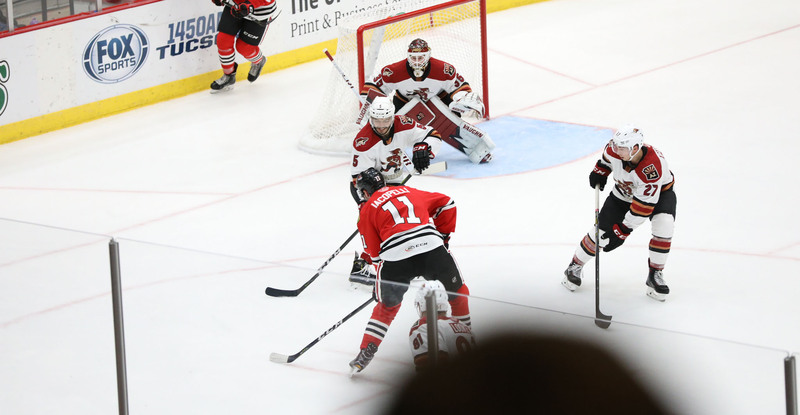 The IceHogs would net a pair of power play goals in a 22-second span to tie the game 3-3, and add two more in the third, including an empty-net marker with 1:14 left in regulation. Hunter Miska stopped 21 of the 25 shots he faced in the loss. Despite the loss, the Roadrunners outshot the IceHogs by a heavy 38-26 margin. The Roadrunners begin a four-game road trip Friday night against the Ontario Reign at Citizens Business Bank Arena, where the puck is scheduled to drop just after 7:00 PM PST.